There is no better place to spend your Bachelor Party than Sin City! If you plan on coming to Vegas for your Bachelor party then you are not going to want to waste any time trying to figure out where the best clubs are and waiting in line. Book a Private Party for your Bachelor Party and we’ll make sure that you and your group have the night of your lives! Our VIP hosts will take care of everything – from picking the hottest venues and the best parties of the night, to making sure you get to bypass all of the lines. You won’t even have to mess with cover charges. We’ve got you covered. Ride the party bus and walk on a guided tour to carefully selected venues just for your Bachelor Party. The tour comes with party favors, drinks, drink specials, party games, snacks, drinking games, and icebreakers. Just show up and be ready to party – we’ll take care of the rest! There are few places in the world that are as perfect for a Bachelorette Party than Las Vegas. Give your girls a night to remember by celebrating your Bachelorette Party in the exciting Sin City. 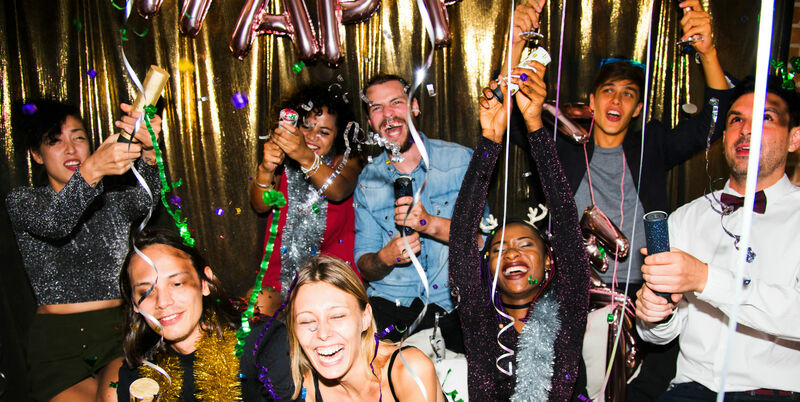 Booking a Private Party tour means that you get to celebrate with your friends instead of wasting time trying to find the hot venues and standing in line – hoping to get in. Our VIP hosts are party experts and ready to find the hottest clubs of the night for your special day! Leave it to us to get you in the venue with no cover charges. Ride the party bus and walk on a guided tour to some of the best parties that Vegas has to offer. Your tour includes Bachelorette party favors, finger food, drinks, drink specials and tickets, and party games! Book your tour today to make your Bachelorette Party the party that you and your friends will never forget! Celebrate your birthday with a night in Vegas! There is no better way to celebrate your special day than going to the hottest parties and venues in Las Vegas. You should never have to spend your birthday waiting in a line just trying to get into a club. Take a Private Party tour and skip the lines! No cover charges, no waiting. Our VIP party hosts will make sure you spend your day having fun. We select the best parties in Vegas for you on the night of your tour. You’ll ride the party bus and take a guided walking tour to the hottest clubs. We provide the birthday party favors, drinks and drink specials, drinking games, icebreakers, and snacks. 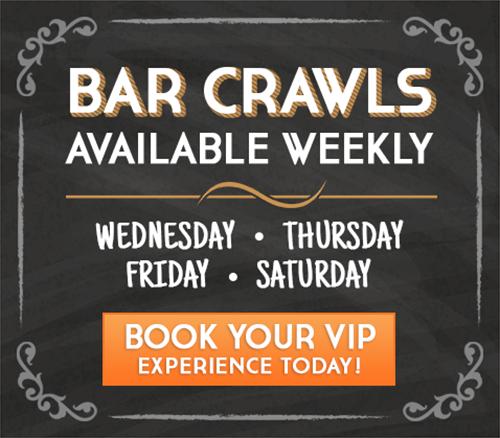 You’re going to have the time of your life when you book a party crawl with us for your birthday. Do you really need a special occasion to celebrate? Every night in Vegas is a party and we’re here to make sure that your night on the town feels like a special occasion. Celebrate your night with a Vegas crawl tour and make it memorable. We’ll get you into the hottest parties of the night. We know all of the venues and where the best parties are so we can get you into the right one for your night on the town. No waiting in long lines to get in and no cover charges. Our party hosts are here to take you on guided walking tours to the clubs and make sure you’re having a blast on the party bus. Our party tours come complete with drink specials, finger food, drinking games, and party games. We know how to party. Party with us for your next night on the town on our Vegas crawl tour. Anniversaries are a special time and there is no better way to celebrate than a night out on the town in Vegas. Commemorate the special date by going on a Vegas crawl tour. You’ll take the party bus to nightclubs that are hand selected by our professional VIP party hosts just for you. Many of these venues are walking distance from each other so you can take in the sights of Vegas together while making your way to the next stop. We make sure to supply you with plenty of drink specials along the way, as well as party games and food! This is the anniversary you’ll remember for years to come. It will be hard to top a Vegas crawl when the next anniversary comes around. There’s nothing stopping you from reliving the experience and coming back to celebrate with us again! Just remember that no two crawls are ever the same. The scene in Vegas changes every night! You’ll want to make this an anniversary tradition! When you’ve recently separated, there’s no better way to celebrate your freedom than a Divorce Party in Vegas! Get your friends together and spend a night out on the town. Our private party crawls are the perfect way to take your mind off the stress of the divorce and celebrate the next chapter in your life. We’ll take you to the best clubs and parties that the city has to offer. Each party tour comes with a personal VIP party host. Your host is there to take the pressure off of you. Your host is responsible for selecting the right venues for your party so you don’t have to guess. You get to skip the lines and never worry about a cover charge. Our tours also come with drink specials, party games, snacks, and more! Celebrate your new freedom with a Vegas party crawl! The absolute best way to celebrate a night in Vegas is with a party crawl tour! Our private party crawls are custom designed to fit your theme – whether that’s a Bachelorette or Bachelor party, birthday party, anniversary, or even a divorce party! We take all of the stress out of planning your night out on the town so you can concentrate on celebrating! Leave the rest to us. Our VIP hosts are party professionals! They know how to pick out the right clubs and venues and find the nightly parties. We supply the snacks and themed party favors. We even hook you up with drink specials. You won’t have to wait in line or pay a cover charge. We’ve got you covered! Join us for a celebration in Vegas that you will never forget! We can help you make your bachelor party great! Vegas is the world’s best bachelorette party location! Your birthday is special. Celebrate it with us in Las Vegas! For any special occasion or no occasion at all! Create anniversary memories that will last forever! We can help! When you’ve just divorced, there’s no better way to start your new life! Had the best night of my life, definitely a must do in Vegas. From the start the hosts got the party started and they took care of everything - definitely would recommend this tour to anyone who likes to party! Your birthday is special. Celebrate it with us in Vegas!